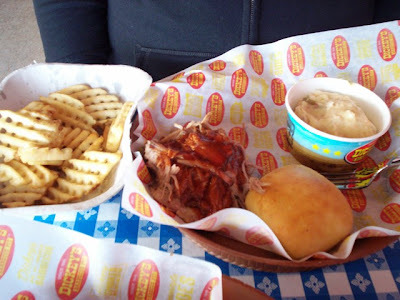 In our quest to visit three different restaurants per city, this week found us at our third lunch spot - Dickey's Barbecue Pit. 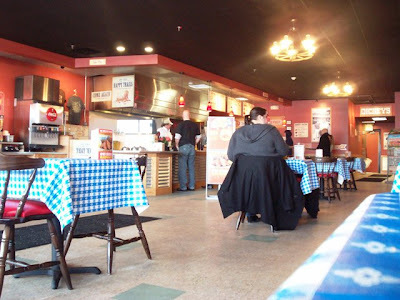 If you recall our first place was Tito's Cantina and our second was DiParma Italian Table - all in Seekonk. I read that Dickey's had been open since November, but this was the first I'd heard of it. I was very excited because a BBQ restaurant in this area is quite rare. So you know Laura and I couldn't wait to give it a try. We arrived around 2:30 p.m. on a cold but sunny day. 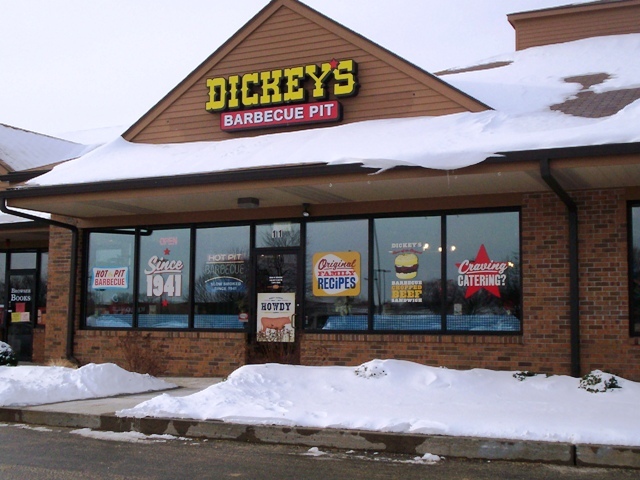 Dickey's has a good-sized storefront site located in a small strip mall off of Route 6. Upon entering, you notice that it has a nice open seating area and an ordering counter in the back. Laura and I ambled down to the back of the restaurant to place our orders. Far view of the ordering station. Free ice cream and sweet tea stations. 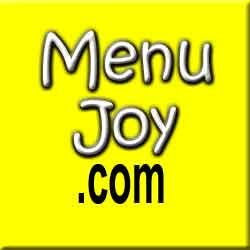 You order cafeteria-style here. First you meet the "meats" guy. The different meats are listed on a large board above his head. They have pulled pork, beef brisket, ham, turkey, chicken, ribs, and sausage. All promise to be slow-cooked and fall-apart tender. Then you slide down to the "sides" girl and choose from a nice variety of old favorites like waffle fries, coleslaw, potato salad, green beans, beans, and macaroni and cheese. Plus, they have a few new ones like baked potato casserole and fried okra. Then you slide down further and get your drinks. They have bottled soda and water. They also have a 32 oz. "Big Yellow Cup" that is refillable. Of course, they also carry sweet tea. A bonus is that they have FREE soft-serve vanilla ice cream with little cake cones. I also saw slices of pecan pie. You slide along again until you hit the register - then you pay. Easy peasy, right? Well, it should have been. It should have taken all of about five minutes to get your food. But Laura and I were in line about 15 minutes and there was only one other customer. Why? I'll explain. We went to get our meat and we both wanted the pulled pork: Laura's in a sandwich plate and mine as a one-meat plate. As the young man pulled our pork (pulled our pork? ), we told him our sides. Nope. We had to order those further down. But there was no one at the sides spot. We waited and waited, nothing. So we slid down further and chose our drinks. Then the sides girl got back to her station and wanted to know what we wanted. We hurried back up to her now. Laura got potato salad and the baked potato casserole. I wanted the casserole also plus the waffle fries. I guess it was a potato kind of day. Now we had to watch while the sides girl emptied more potato casserole into the empty container and heat it up in boiling water. I wish I didn't have to watch this. It should have been done before hand. Then she had to fry up my fries, which came in pre-measured packs of around a dozen fries. I didn't mind but the fries had to be brought to our table later. While the girl was struggling with our sides, the meat guy (remember him?) was yelling down to where we now were and asking if we wanted onions or coleslaw on our meats. Laura yelled back, "Yes on my sandwich, but no on the meat plate." This was getting really uncomfortable. They finally assembled our plates and we got to the register with bottles of soda in hand. The same girl now rang us up, asked if we had drinks (Laura said, "Yes, in our hands!") and almost charged us for the next customer's sandwich. Whew! We finally got seated and dug in while both agreeing that this was a "trying" experience. My whole plate was absolutely delicious - thank God. The pulled pork was melt-in-your-mouth tender. I loved the baked potato casserole with the bits of bacon mixed right in. The waffle fries were crisp and hot. Plus, I got a sweet bun (very surprised there was no corn bread) that was tender and buttery. Laura loved her sandwich, which was piled high with the pulled pork and crisp cole slaw. She loved the baked potato casserole as much as I did. After she got over the bright yellow color of her potato salad, she loved that too. We both got a nice amount of meat and the sides were like a half pint each. We certainly didn't leave hungry. THE VERDICT: We'd definitely go back. The food was just delicious, plentiful, and a reasonable price. But that service ... they have to fix that service. Maybe they're still working out the kinks, but cafeteria style is supposed to be quick, with a person at each station. They need to get this right so this place can become a big hit. 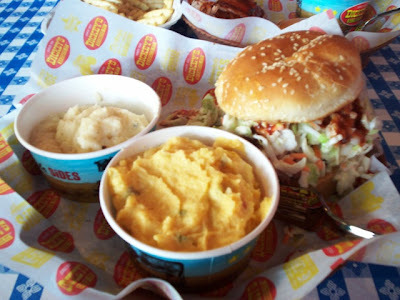 Dickey's also does parties and catering so click here for their complete menu and many locations. P.S. 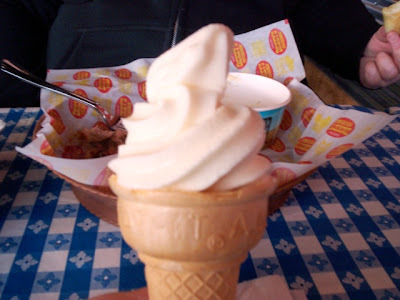 : To the parents of the boy that kept getting up, getting ice cream cones, licking the top. and then throwing them away ... please don't allow that. Just because it's free, that's no reason to allow such waste. He did this at least five times. Teach your kid to be respectful, please. P.S. again: The restroom was a little messy but overall nice and clean. Keep it up! The Dickey's in Seekonk is located at 20 Commerce Way in Seekonk Square. 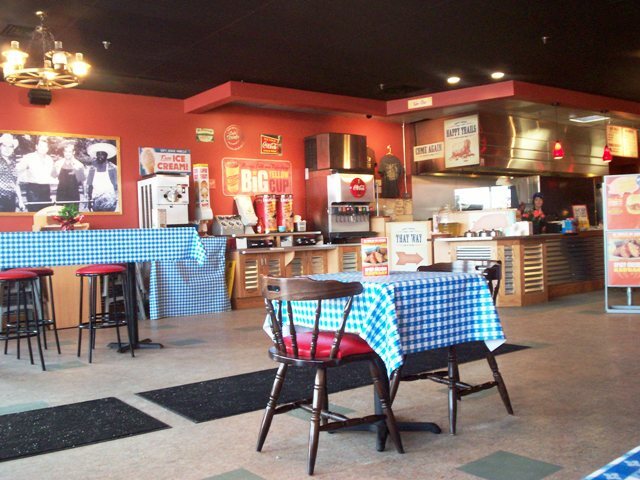 For more information, call (508) 336.6200 or visit the Web site at Dickeys.com. This location is open daily from 11 a.m. to 9 p.m.